We could not walk past the purple cauliflower at the farmers market this week. My daughter immediately rushed to the table and picked up one and put them in my hands demanding that I buy it because she wanted the cauliflower which came in her favorite color: Purple. Today, we decided to make gobi paratha for lunch. It was so perfect with the rain and cold weather in this part of the county.What amazed me was the color of gobi when we grated it. Absolutely beautiful and most colorful thing that I have ever cooked with. It tasted delicious and made the paratha's look so photogenic. 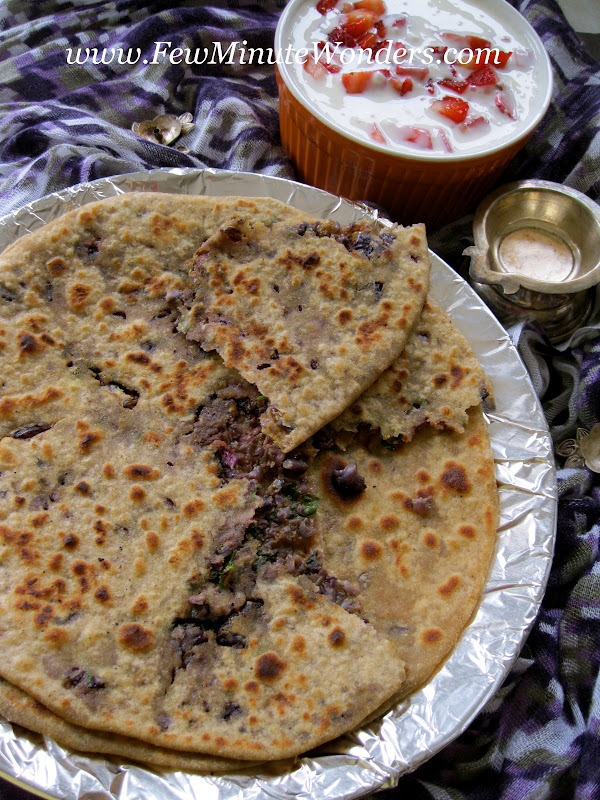 I served this spicy paratha with strawberry raita and I must say it was perfect. 1. Add the flour, salt, oil, ghee to the food processor and mix for 30 seconds. Add water 1/2 cup at the time and run the processor until the dough comes together. Wrap them in plastic wrap and put them in the fridge until ready to use. 1. Heat the wok with ghee and oil to medium high. Add coriander powder, ajwan seeds and allow them to blend in the oil for a few seconds. 2. 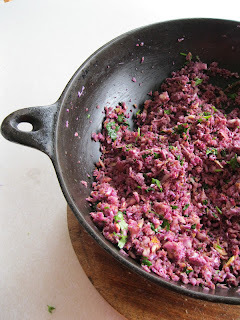 Add the grated cauliflower to the wok and mix well. Add turmeric, chilli powders and salt. Mix well. 3. Add the dash of lemon juice, mint and cilantro. Remove from heat. 1. Divide the dough into 8 equal portions. Make balls of the dough and flatten it and dab with some flour. 3. Seal the paratha by bringing the open edges together. Sometimes some air bubbles would be trapped in the ball. Make sure to release it before sealing. 4. Remove the dough from the ball roll in some flour, flatten and then roll out into a thick paratha. 5. Place it on the tava that is heated on medium high. Cook on both sides to remove the rawness and then add ghee/ oil mix on both side. Serve them hot with strawberry raita. Truly colorful, a perfect treat to the tummy and the eyes. Never seen this colored gobi before. 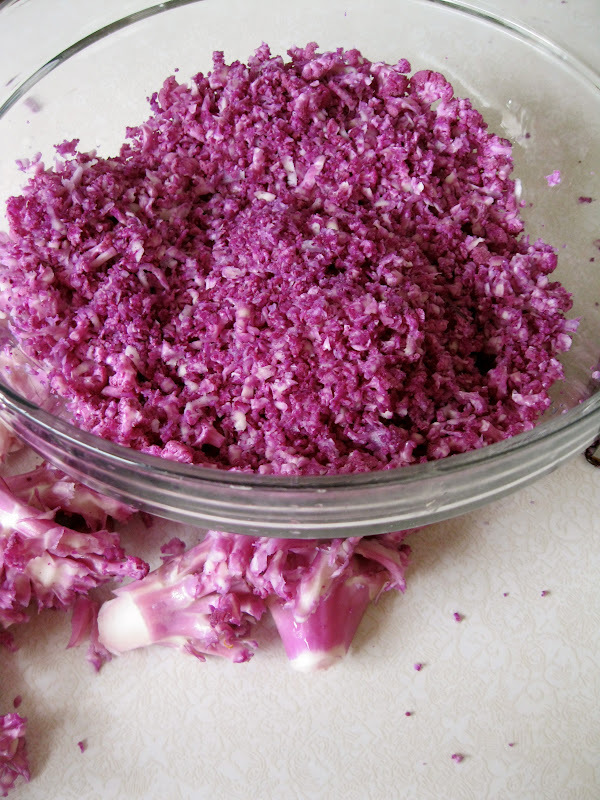 Purple cabbage is common though. The cup idea is smart! Never seen the purple ones,How does it taste?Looks a colorful n healthy paratha!! Looks so awesome, I've never seen purple gobi..